I didn’t have a lot of time in Tel Aviv, I had spent most of my time in Israel exploring the rich history of Jerusalem. Because of time constraints, I wasn’t able to give Tel Aviv, and many other areas in Israel, the time they required. One thing I absolutely knew I had to do though was spend some time at the beach. Tel Aviv enjoys a princely position on the Mediterranean Sea, with a sprawling beach and magnificent views of the expansive sea. As with many hotels in the city, my hotel was well situated just a couple of blocks from the beach, the sea and the warm ocean breezes. On my first afternoon in Tel Aviv, I dropped off my luggage and ran to the nearest beach access, marveling at the stunning views as the sun slowly sunk below the horizon. It was too late to enjoy the ocean itself, so I vowed to start early the following day and spend at least a couple of hours on the beach before touring the city itself. After a rocky night’s sleep during which I was plagued by a funky smelling room and the constant buzzing of the old elevator next to my room, I groggily approached the hotel’s front desk to try to get some change. I had recently taken money from the ATM and I only had large bills; knowing I would have to rent my space on the beach, I desperately needed smaller bills or coins. I should have guessed it wouldn’t be that simple. It had all happened so fast and I was so befuddled at the exchange, I just thanked her and wandered out the door. Ok, time to regroup. Surely I would pass a shop or something that could help me out, even if it meant buying something. Alas, that too was not too be, it was early and I guess people don’t need convenience stores before 8:00 AM on the beach. The prices were reasonable enough, but my smallest bill was a 200 shekel note. I nervously approached the swarthy guy and tried to rent a beach chair. Not surprisingly, he didn’t have change but assured me that he would by the time I left. Ok, great, this would work. I made myself comfortable, swam, read a bit and just enjoyed spending time in and around the Mediterranean. The water was a bit chilly at first, but warmed up quickly and I floated back marveling at the Tel Aviv skyline and the ancient port city of Jaffa in the distance. Not for the first time, my head reeled from the shear historical magnitude of the area. 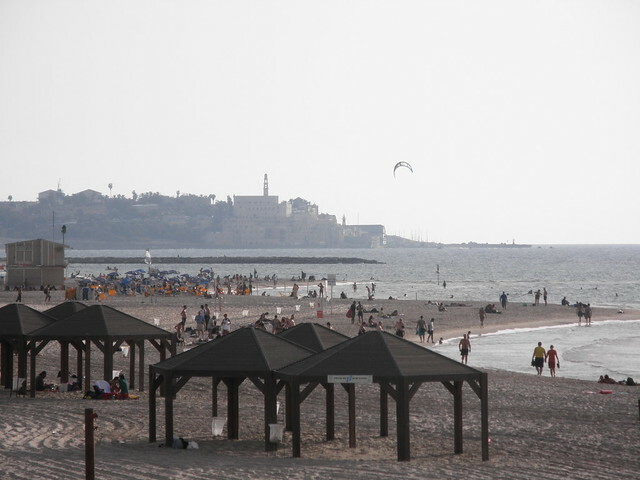 I was swimming within sight of Jaffa, the oldest port in the world, the entry point for the cedars of Lebanon Solomon used in his great temple and where Jonah set sail only to be swallowed by a whale. And now here I was in 2010, Matt from Washington, D.C. just floating around in history. After my few moments of introspection, I decided that I had spent enough time at the beach and needed to start touring. It was the only full day I had in Tel Aviv and I had a lot to see. I toweled off, gathered my things and set off to find the swarthy beach vendor. Unfortunately though, he didn’t have enough change for me. He asked if I could wait a bit, and I grudgingly agreed. Finally, after thirty minutes of killing time on the beach I told him that I had to go and would return later with the money. He just smiled at me, slapped me on the back and told me not to worry about it. I’m not sure if he was trying to foster friendly international relations or to impress the young lady with whom he had been flirting all morning, but it didn’t matter. I took my cue and scurried off to explore the White City. So if you find yourself in the great city of Tel Aviv, be sure to allow yourself plenty of time to enjoy the ocean, and don’t forgot your change. Dying to get to Tel Aviv, I have a feeling I will just have this strong connection with the place. Great piece… planning a trip to Israel and Jordan next spring and unfortunately don’t think we’ll make it to Tel Aviv other than to the airport. Maybe we’ll have to carve in some time before we catch our flight. You definitely should. As I wrote, I didn’t spend a lot of time there but I’m glad I got to see it. The vibe there is completely different from the rest of the country and walking along the beach to Jaffa is now one of my favorite travel moments. 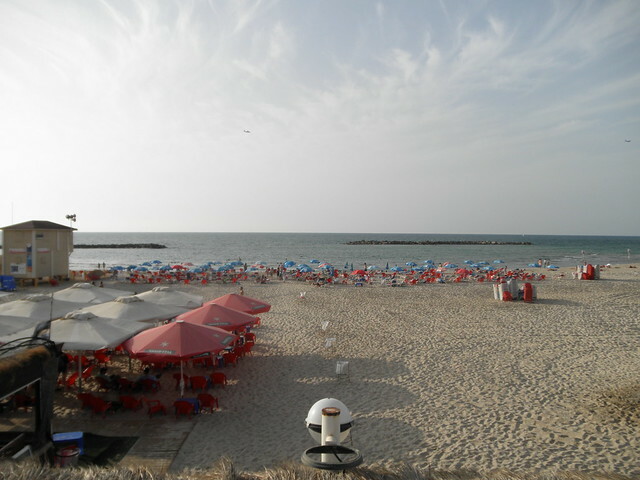 I can’t wait to go to Tel Aviv; Israel is one of my top 10 places to visit… won’t be for another couple of years though! Andi and Claus: You both should visit, wonderful city. Whereas Jerusalem is great for its history, museums and sites, Tel Aviv is great just for its personality. Would love to go to Israel to explore. I can only imagine how culturally and historically fascinating it would be. While traveling in Spain, I met a woman from Tel Aviv and she has me hooked! She didn’t mention the beach – but it looks like a great spot to relax after a few days of seriously touring!